The story repeats itself, over and over - where there was an overabundance of rain, snow, ice and extended sub-freezing cold, the bird count is down. Consecutive years of severe weather, handicaps the rebound. The breakdown: Bobwhite whistle counts in Kansas were about the same as last year. South central and southeast regions had reports of slightly higher whistle counts compared to last year. Last year saw in increase in both the number of birds harvested (485,000 up from 410,000 in 2008) and the number of hunters (72,900 up from 69,800). The regions with the highest harvests were south-central, north-central, as well as the whole western portion of the state. Kansas Pheasant-- the predominate, western Kansas pheasant localities now have the makings for the fourth consecutive favorable spring weather. Southeast Kansas did have a good May, the first in a long while. Therefore, with Kansas having a good spring weather pattern on top of high prior season pheasant populations, the 2010 pheasant hunting season looks to be excellent. Iowa Quail and Pheasant -- 2009 Iowa upland bird hunting for both pheasant and quail followed expectations with the lowest of our three state region hunt quality. The dry spring during May and June 2009 was encouraging. However it also showed the previous decline in quail numbers too severe to be overcome with one good breeding season. Iowa pheasant numbers continue to decline. Any gains archived through the 2009 good spring have been erased with very high spring 2010 rainfall. Missouri Quail -- The 2009 Missouri quail season was a pleasant surprise with higher than predicted covey counts. Admittedly, Missouri's quail covey counts were lower than historic averages. They were higher than the forecast indicators allowed us to believe. 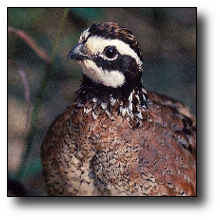 We saw again this year in Missouri how Bobwhite Quail are more prolific at re-nesting than either turkey or pheasant. The good news for Missouri continues, there was also a good level of quail surviving the season. Spring 2010 was a mix for Missouri in terms of unfavorable and borderline acceptable rainfall. The short answer is if looking to Missouri quail hunt it should be better in the west part and less productive in the central and east. Northern part of the state along with the southern part of Iowa, hit hard for the 4th consecutive year by Mr. Weatherman. South Dakota Pheasants - (Aug. 26, 2010) - This autumn, hunters in South Dakota will enjoy pheasant numbers that continue to be some of the best in the state's history. The 2010 brood survey count shows a small increase from the 2009 survey. The Game, Fish and Parks Department completed its annual pheasant brood survey in mid-August, and tallied a statewide pheasants-per-mile count that is up about 3 percent from last year. Nebraska Pheasants - Severe winter weather in parts of Nebraska and above average rainfall this spring impacted pheasant populations in parts of the state. Statewide, however, the pheasant abundance index was similar to 2009. Increases in abundance were observed in the Sand-hills and Southwest districts. 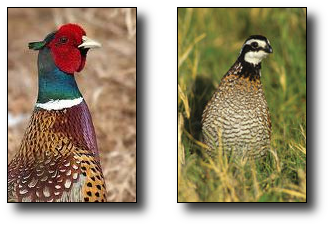 Abundance was similar to 2009 in the Central pheasant region, but declines were noted in the Northeast, Panhandle, and Southeast regions. Observations by district biologists support these results in most regions. Pheasant abundance appears to be high again this year in the Southwest region, which offers excellent opportunities for hunting. Northern Bobwhite - Bobwhite populations in the core areas of their range in Nebraska experienced prolonged periods of deep snow cover, ice, and freezing temperatures. Above average rainfall and localized hail storms occurred during the breeding season, as well. These severe weather events negatively impacted populations. Abundance indices from the Rural Mail Carrier Survey and the Bobwhite Whistle Count were lower in all bobwhite regions except for the West Platte. Reports from district biologists support the survey results, with reports of low quail numbers and small covey sizes in the spring. Despite the declines in abundance indices compared to 2009, overall abundance was still highest in the Southeast.